If you play too much Tetris, then you should check out the new subpage: The Tetrad Corner. 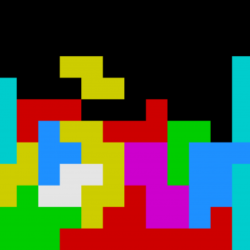 It’s a collection of things I’ve made this week about the shapes used in tetris (‘tetrads’). The original idea was that it would be cool to have a tetradic phone password. That is, your password makes a Tetris shape on the keypad. I was bored enough this week to actually write a little script for it, along with a PHP class for rotating the blocks, rendering them as a HTML table, etc. Now what I do want is a few tetris blocks for my desk, so I made up some nets to print out and cut up. Now I can make a small paper Tetris game! (PDF linked to image above). Neat huh? Update 12/4: I built these shapes today. There were two tabs missing on the nets (fixed! ), so I cheated by using sticky tape. Click to enlarge the cheesily-colourised image. This is an old project of mine to make a webserver. It is fairly functional if a little incomplete. You can find it at http://mike.bitrevision.com/webserver/. The source code is straightfoward, and could be quite useful if you are writing your own webserver. Hopefully with less bugs, of course. As a small experiment, this PHP script (source code) will suggest fruit combinations for making citrus cordial, based on what is available. It will also tell you how much sugar, citric acid, and tartaric acid you will need. If you live in a region with some very exotic citrus fruit, then you can easily modify the fruit list at the top of the code, and run a copy locally. I’ve just finished writing up version 0.04 of my fairly buggy raycaster demonstration, which you can find at bitrevision.com/mike/raycaster. The source code is also available from there. This one will only work on Windows. Movement: Up, Down, Left, Right arrows. Return to start: Enter (return). The rendering bugs in this version will be fixed by a partial re-write for the 0.05 release. I’m upgrading from Firefox 0.x to 2.x on one of my computers. Decompressing the downloaded file seemed to be taking far too long, so I took a look at what was up. Somehow, it seems that the incomplete download of 2.4MB (the whole thing should be around 9MB) managed to cause gzip to write out 521MB of data before I stopped it. The moral of the story? Always check the MD5 sums. I have seen this message more than I would like. Seriously, whoever was cruel enough to invent an error message like this deserves a cookie for ingenuity.